Security researchers and local computer emergency response teams try to understand what exactly malicious software does and what communication channels to external systems it relies on. Ultimately, they have two basic ways to draw conclusions about where the software came from and its intentions: reverse engineering and sandboxing. The tool presented here, Cuckoo, is a sandboxing tool. With ransomware and similar forms of malware, the modus operandi of the attacker is typically predictable: To begin, they need to find a gateway into the target network. Other than exploiting vulnerabilities in software, email malware is a very popular way to breach a network, with a recent trend – that unfortunately outsmarts some mail scanners – of adding multiple attachments, with only one attachment containing the malicious software. Social engineering also plays an important role in acquiring information that serves as the basis for an attack. Once an attacker finally gains access to a system and dumps the malware, the next step usually is to install a remote access tool (RAT) that is handled by a command and control system. At this stage, an attacker can establish permanent access to the infected system and other systems on the local network to get to the desired data. To apply reverse engineering, you examine and disassemble the software statically to understand what the code does, which requires appropriate tools (e.g., the well-known IDA Pro ). For sandboxing, you install the software within a secure environment, often a virtual machine or hardware appliance (e.g., FireEye  is a well-known manufacturer of such appliances), and observe its activities in real time. Both methods have their advantages and disadvantages. Reverse engineering requires a very good understanding of machine language to deal with the appropriate tools and interpret the results, but it does give deep insights into the code of the software and the ability to explore the tiniest nooks and crannies. Sandboxing produces much faster results, with the risk, however, that the malware detects it is running in a sandbox and thus potentially executes completely different code paths than it would outside such an environment. The disadvantage of hardware appliances is that they are less flexible than software, which you can adapt to suit your own landscape. Cuckoo  was launched in August 2010, and the release candidate for version 2.0 was published recently. The Linux software is licensed under the GPL3 and is available for download free of charge. Although Cuckoo is used in professional environments, the freely available software is interesting for students and young researchers who tend to shy away from investing in what are often very expensive hardware appliances. Cuckoo operates parallel to hardware appliances in part, because the software's modular approach lets you adjust it for your own environment and thus achieve better test results. Cuckoo offers a number of interesting features: The software analyzes a wide variety of file types and monitors every system call to the malicious software running inside a virtual machine. It observes all files that are created, deleted, or loaded from external sources by the malware; records network traffic and saves a dump as a PCAP trace for evaluation; and creates a memory dump of both the complete virtual machine and of the malware processes to secure the contents of volatile memory. If you pick up the special wget.py module for downloading malware  from the Cuckoo Git repository and copy it to the install folder /analyzer/linux/modules/packages/, you can also examine entire websites for malware . All the results are summarized in a report and staged for evaluation. At Cuckoo's heart is a central management component that is responsible for scheduling analyses and evaluating results. The jobs themselves run on isolated virtual machines that are newly generated for each analysis task (Figure 1). Cuckoo requires a Linux host system, although the software probably has also been used successfully on Mac OS. 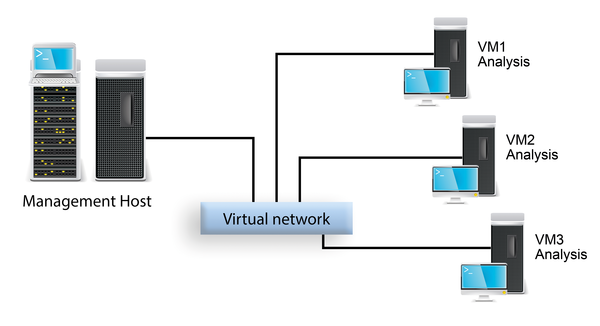 The supported virtualization solutions are VMware, VirtualBox, and even KVM/libvirt. Within the virtual systems on which the malware is installed, Cuckoo supports Windows, Mac OS, Linux, and Android. Figure 1: Cuckoo launches a virtual machine to investigate malware.